October Afternoon's brand-new Decade Stamps (TM) are the perfect way to record the "when" of any event, journal, or photo. These versatile roller stamps provide that classic, date-stamped look. 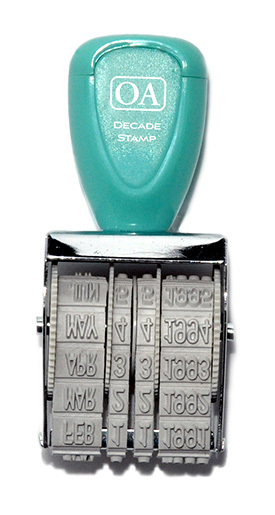 Stamps the month, day, and year -- covering a full decade! Multiple decades are available. Each decade features a different, era-coordinating font. The year section can also stamp an arrow, or even be left off entirely for complete creative flexibility. Both digits of the day can be set to the numbers 0-9, a dash, or a space. Use with ink or markers. Easily adjustable roller-dials. Sturdy construction.